It should cost as little as possible. As I cruised my Pinterest Boards for inspiration, I noticed a pattern on my "For the Home" board. Many of the art display options were something you could swap out easily - whether it involved clips or simple little ledges. 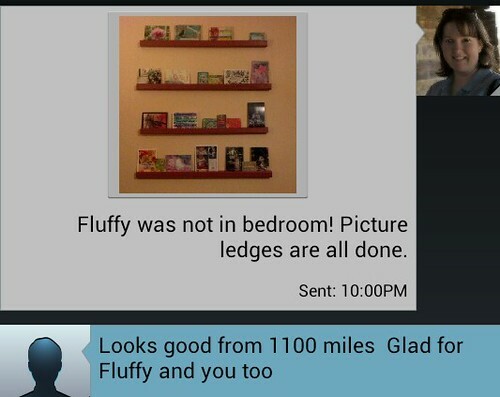 So, I decided to finish up a project I started with dad back at Christmas time - my "Artful Ledges". When I moved out of the farm house and mom and dad moved into it, they did a LOT of work to it - including replacing the old wood deck on the front of the house with a new, plastic deck. When dad demolished the old wood deck I asked him to keep/he decided to keep (it's been about six years - we don't really remember who started it) the spindles that held up the rails. Over the years, we've talked about a lot of different uses for those spindles, but nothing really seemed right. And then it hit me - they'd make really cool picture ledges. So, just before I went home for Christmas this year, I asked Dad to grab some of them out of the barn, and set aside some time for a little project. Step inside the wayback machine and let's head back to December - shall we? Here we have dad cutting my little ledges down to size. 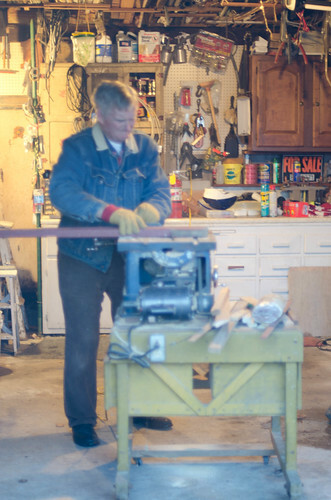 The Man loves his table saw! After he cut them to the length I had marked for him (a little bit of a funny story on that later), I decided where to put the groove. 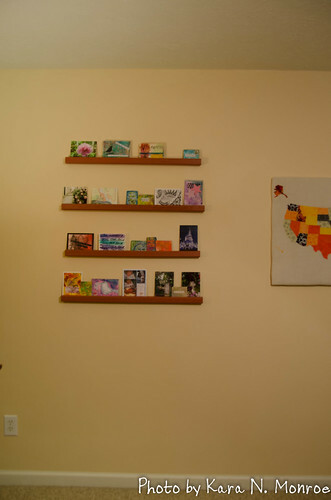 Dad's trusty index cards served as my makeshift art pieces and the pieces of wood that may turn into a second set of shelves in the near future served as the "wall" they would lean against. Marks were made and then dad simply used the table saw to make the groove. Repeat that times four and we loaded the little guys in my car to head home and be finished there. Fast forward to February 20 when the winter Pinterest Challenge was announced over at Young House Love. I started cruising my Pins to see what I wanted to take on and noted the aforementioned theme of photo display options and decided it was high time to finish my photo ledges. The pieces were a color I affectionately know as barn paint red. While I liked the color, a few weeks ago, I picked up a test pot of paint at Lowes in a color that's similar to the reddish color in my home office. I decided to test out that color on the picture ledges. Here they are post painting (and G - if you're reading this - see how handy a crazy large number of skewers can be when you want to keep painted edges up off of paper while they dry.) I let the paint dry for several days. At this point, I'm out about $3.50 for the little sample pot of Valspar paint. Everything else I had on hand or was recycling. I finally decided I wanted these to go in the sort of travel themed area of my office - the long formerly white wall - holds my last Pinterest Challenge Map project and I may add some more trip photo display groupings shortly - but I'm getting ahead of myself. Where were we? 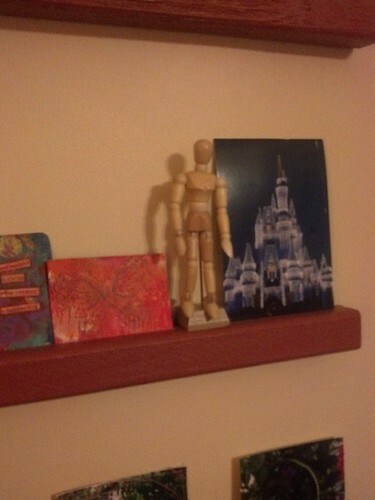 Oh ya - before they can be art ledges they have to get on the wall. So, Monday night after dinner with friends, I decided it was time to hang these suckers! 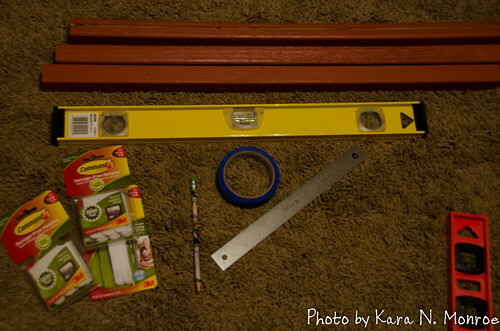 I grabbed my supplies - a level, blue painters tape, a pencil, 3M Hanging Strips , and a ruler. All of that stuff was in my tool/supply stash already so I'm still only out a grand total of $3.50 in new money. And, now, it was time for the fun part - a little math. I knew that to get these level with only my two hands was going to require using the tape trick. (And in case you want a YHL quality tutorial on picture ledges - that's the link you want!) 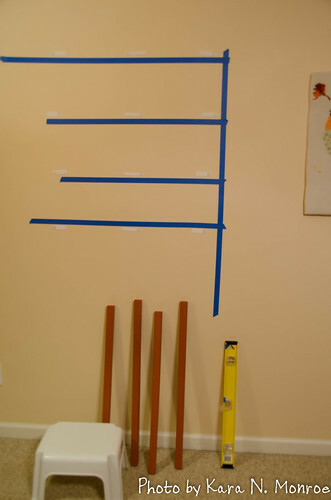 So, I first put up a piece of vertical tape using my level to make sure it was as close to straight as possible. And then it was time for all the measuring and marking. I wanted 9" between each ledge. I figured that was enough for a 5 x 7 size print or even an 8 x 10 laying on its long side - with room to spare. So after a little measuring up the wall and some light pencil marking on the tape (see all my little arrows and lines below) I figured out where I wanted the bottom most ledge to be placed. With that information, I added a piece of tape on the horizontal along where that bottom ledge would go - again using the level to keep it as straight as possible. 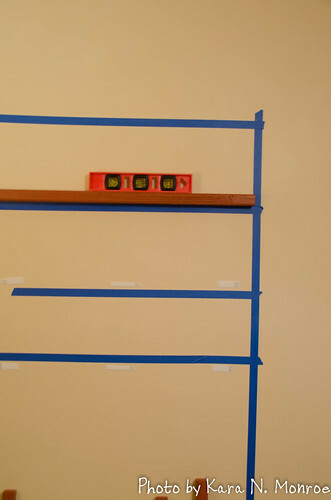 I measured up the vertical strip of tape 9" from the top of that first ledge (each ledge is right about 1 1/4" tall) and marked both the top and bottom locations on the vertical tape then put in another piece of tape on the horizontal. Okay - I think in this case - a picture may be worth well more than a thousand words. This is what it looked like when I had all four ledge locations taped off. And if you're saying to yourself, "Self, why does the bottom piece of tape look closer than it should?" You'd probably like to know that I didn't feel like crawling on my hands and knees, so the bottom piece lined up with the top edge of a ledge while the others marked the location of the bottom of the ledge. With all the measuring out of the way, it was time to get to hanging the ledges (finally!) But wait! Did you happen to notice these little guys aren't all the same length? No? That's okay - I almost missed it too. Look again - now you see it don't you?! I don't remember Dad and I purposefully choosing to make two of these one length and two of them another, but we did because two ledges are exactly 1 3/4" longer than their friends. I decided just to stagger them. 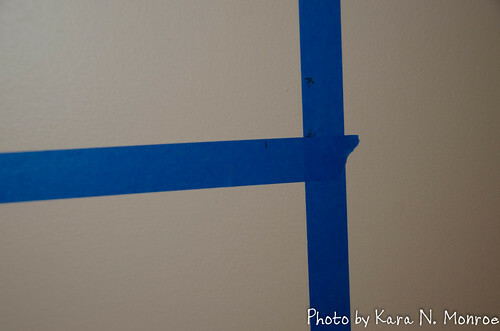 Quick measuring and marking on the tape and a near crisis of uneven edges now looks like a perfect plan! 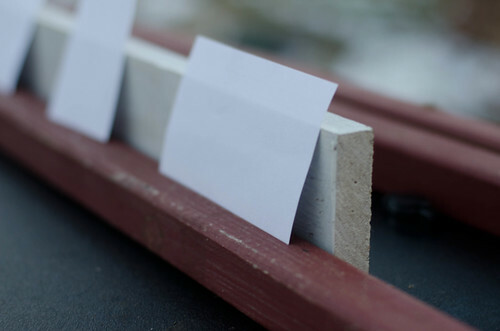 The basic process of those 3M strips is to put them onto your item to be hung, then press them against the wall in the desired hanging location for about 30 seconds. Press hard. Then unhook the velcro like tabs from one another and let just the wall side hang out for about 30 minutes. You can get a good idea of what it looks like in progress here. Note the while velcro-y tabs on the wall near the bottom two pieces of tape and the third ledge is just hanging there for a second holding the level while I quickly grabbed a photo. 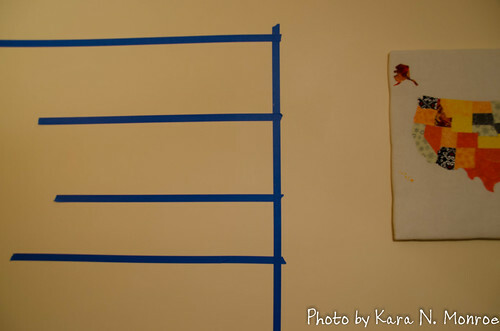 Even though I made sure the tape was level, I did use my small level on each ledge to ensure it was nice and straight. I have both a large and a small level (the small one is pictured here). The large one was great for placing the tape originally, but it might have been a little heavy to let it sit on a ledge so I was glad to have the lighter, smaller level for that purpose. ...and then it was time to press the velcro bits back together again. And, in just seconds, you have this. 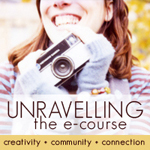 Grab a few postcard swap postcards and other artful/photographic inspiration and arrange to your hearts content. And, because the ledges are a little over an inch deep, I can add small objects to them as well. The 3M strips are rated for about 12 pounds and the ledges themselves weigh less than 2 pounds so I think this little guy is fine here for a while. I had been talking with mom and dad on the way home from dinner and told Dad I was finally hoping to finish this project. I texted him a photo when it was done. I love this project for so many reasons. First of all it met all three of my goals - coming in at only about $3.50 in new money for me the cost was definitely right and it was a project I'd obviously been thinking about doing since Christmas. I also love that I can rearrange the art on it - adding in my own things and pieces from others as easily as picking up the pieces and moving them. I also love that the wood came from my old house and it's found a place in my new home. And, most of all, I love that it's something dad and I did together - even if it got finished while we were 1100 miles apart. It looks great in the room and adds so much character to the loft/office area. 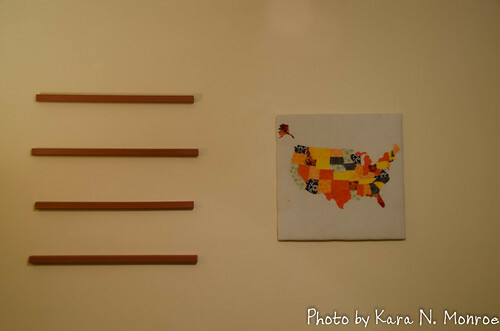 Have you made anything you pinned recently? Have a great way of making the old new again? I'd love to hear it. Leave me a note in the comments. Thanks for explaining your process. 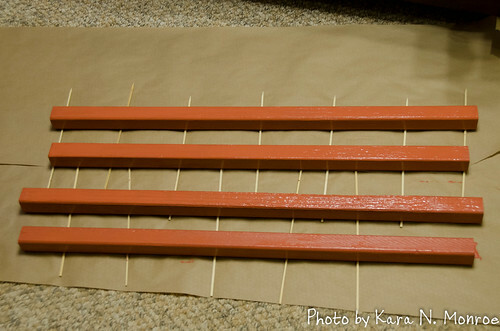 I had a difficult time understanding the picture of the wood strips drying on the sticks--couldn't figure out what that was. You are amazing. I pin ideas but rarely do anything with it. So nice to see a project come to completion and yours is fantastic! 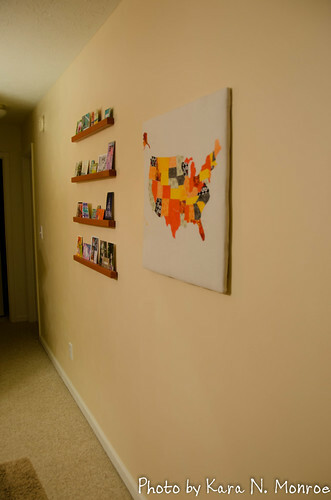 I love shelfs like that, an idea I also want in my home but have yet to execute. Well doen for getting it done!